intricate and precise like all legumes. These beans survived because they’re NOT in my garden. Most of my peas and beans grow on the alley, facing west, where they took the full brunt of the storm. These are in the yard next door, a rental where the five young guys in residence have granted me continuing gardening privileges in the big sunny plot in their back yard. Unlike my plot, it’s got a fence on the west which largely protected the plants closest to it. 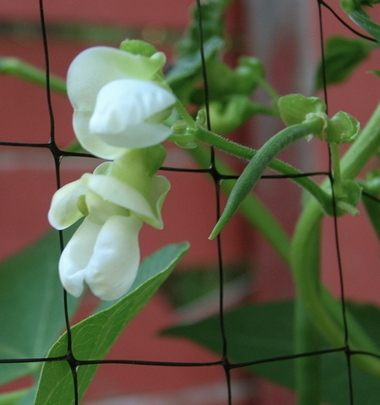 The netting these beans climbed was ripped from the pole above, and many of the beans lost their highest, main climbing stem, but they were far enough along to survive, put out branching stems, and—oh glory of glories!—blossom. So though this isn’t what most people post or expect to see, to my eye, right now, there’s no lovelier sight. Anyone with a philosophical bent has no doubt already galloped off with the bait (or, refusing it altogether, has reined in his horse and stopped reading) and is ready to propose an answer to the age-old aesthetic question: what is the nature of beauty? 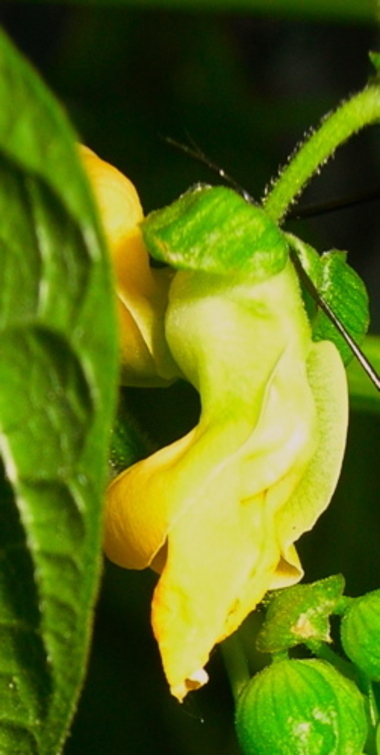 CAN something utilitarian, like a bean blossom or egg-beater, be beautiful? Oscar Wilde, proponent of art for art’s sake, would no doubt be skeptical if not downright scornful, but many artists since him have argued and demonstrated otherwise. But gardens aren’t exactly hot-spots for modern or post-modern artistic sensibilities, so perhaps this rather tired issue seems relevant again in the gardener’s context. And in that context, the “utilitarian” argument for beauty I gave above seems, well, a sort of cheating, as though I’m twisting “beauty” to my own, no doubt twisted, ends. A flower is beautiful in itself, not because it will later provide something I want or even need. And yet…and yet…I know I treasure these small blooms not only for themselves, but for what they represent, what they will bring to pass in the natural order of things–if nature just co-operates by keeping hailstorms at a distance for the next few weeks. So I ask you, what makes a flower beautiful? And to complicate the question, what makes a photograph of a flower beautiful? If it’s a simple presentation of the flower, is the photograph beautiful, or just the flower? 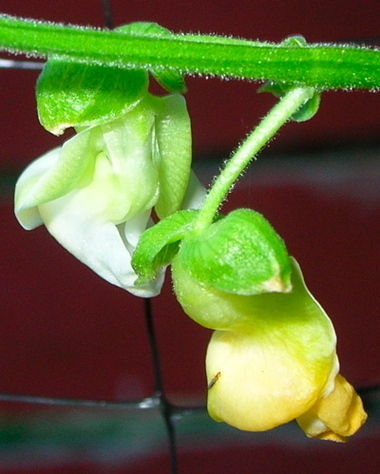 Those are pretty bean blossoms, but I should clarify… I didn’t start Green Thumb Sunday. 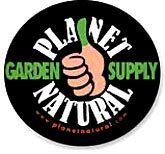 Follow one of the links for Green Thumb Sunday and it should lead you to who did start it. 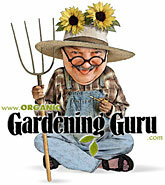 I started Garden Bloggers’ Bloom Day on the 15th of each month. I know, so many special event posts, it can get confusing! The nature of beauty, or the beauty of nature (which do you mean, exactly?) is well, it isn’t. If we perceive something as beautiful, what is that something perceiving us as? I’m thinking of the French philosopher Maurice Merleau-Ponty on this one–that engaging the natural world, and let’s say a garden, is full of reciprocal perception. Beauty is a momentary state of mind, it is a cathartic moment when all our senses come in to balance and, for an instant, we become something more than ourselves–perhaps what we’re meant to be–and get lost in the moment only to find ourselves lost in the moment, and so the beautiful becomes tragic and ugly. Oh hell, I don’t know. Look what you’ve done to me. Look! Benjamin, if you keep talking like that, I’ll say something about how our identities are always already encoded in the cultural symbols that we both create and are created by–Look what you’ve done to me! Look!